Last week was HUGE in terms of developmental milestones. Simon went from sitting to his belly and it wasn’t just falling on his face, although he still does that too. 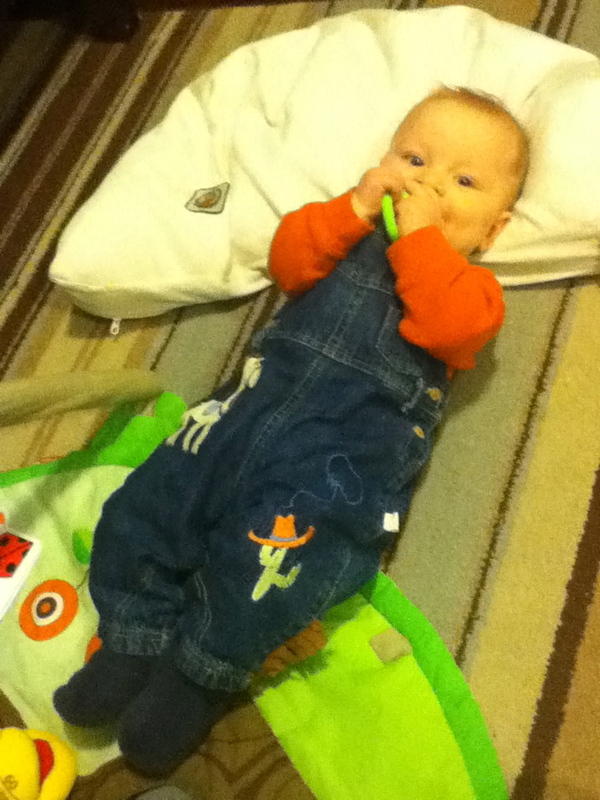 He also started to crawl! It’s a belly crawl and he doesn’t go very far, but we are mobile. I’m not sure if it’s exciting or terrifying, but I think mostly exciting. He’s already improved so much, the first couple of days he was working really hard to drag himself forward, now he’s doing a real army crawl with his forearms and trying to use his legs. Right now that is using one foot that swings up in the air and then sometimes using that foot to push forward. He’s also pretty good at the plank position, getting his belly off the ground, but hasn’t figured out how to get his knees under yet. If placed on his hands and knees he will rock a bit and then slide to his belly. He can get across our rug which is 7 feet. I think he could probably go further, but he has to be motivated. By electronics, or food, or the rabbit, or a toy. And usually if there is something far away he wants he’ll go for it, but the state of our home also means there is usually something on the path closer that will distract him and being closer is the path of least resistance. 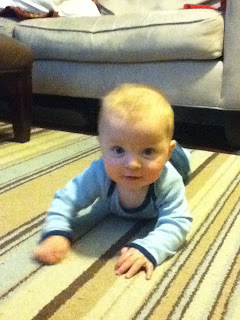 Crawling has also motivated him to roll from back to belly more often to get what he wants. I feel like I’m kind of mean when I keep pushing him to practice by placing him a few feet from his toys. But he looks so proud of himself when he gets there. Or so confused at me when I move said object just a little further away. Simon’s also gotten very busy in the last week. 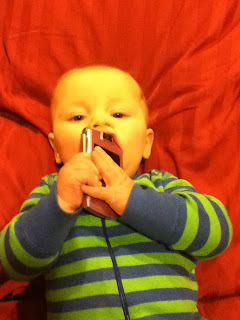 He’ll play with the same object for a good 10 – 20 minutes. Board books he doesn’t quite get, but concentrates so hard trying to turn the pages. And he has one of those shape sorter toys, which he totally doesn’t know how to use yet but spends a lot of time manipulating it. Figuring things out. It won’t be long. With his exploding motor skills and development I have a feeling we are going to soon be in a full fledged “I CAN DO IT MYSELF” phase. He already pulls the spoon out of my hand when I’m feeding him and he’s already getting pretty good at feeding himself things to gnaw on – like a crust of bread. And the church nursery worker said she was helping him with a banging toy and he pushed her hands away. Mr. Independent is growing fast. And here is the best video I have to post at the moment. It’s from the iPod so excuse the quality. The rabbit I think is his new best friend. This morning he crawled over to the cage and held the bars until I sat him up and then he held the bars and talked to Mr. Monkey for 20 minutes. I am seriously loving this stage. Ten random things for Tuesday. 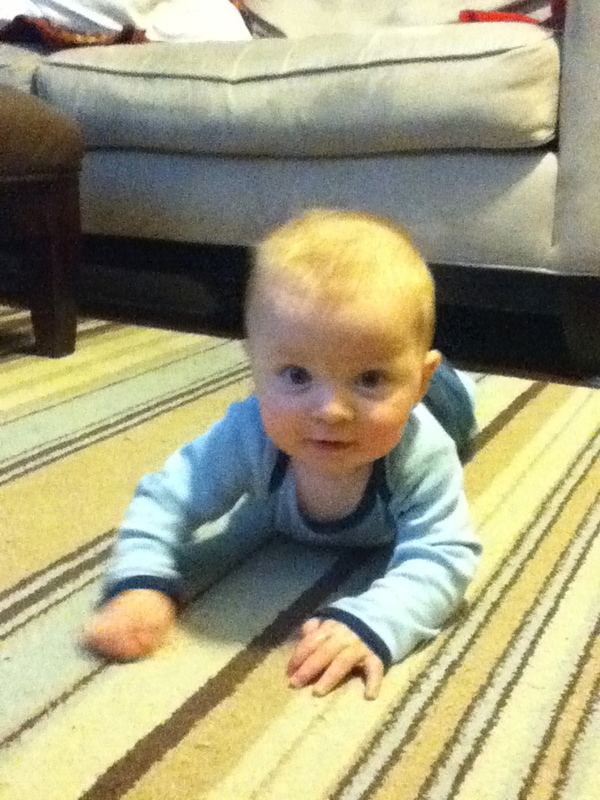 Oh he's going to be crawling soon! I found from army crawl/planking to full out crawling was only a few weeks! It is exciting!